Todd’s Note: For the preparedness minded, critical thinking and investigation are important skills. Experiments like the one below help to foster curiosity and thinking skills that will help when “real-life” issues come up. We want our kids to be problem solvers! When I owned my own computer business, my children were in the shop a great deal of the time. One of the middle children began describing an experiment they learned in school about using potatoes to power a LED. Since I had a lot of equipment lying around, we duplicated the experiment, but on a much grander scale. 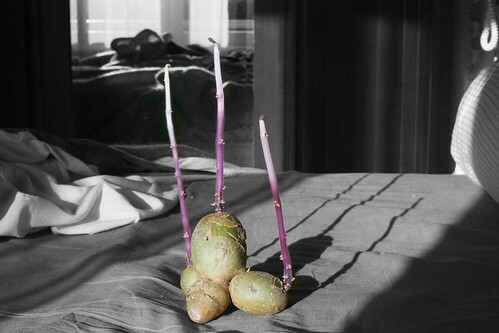 By tying several potatoes in a series, we were able to produce more than 12 volts of power. 1. Learning from History – One day, I watched a History Channel video about Ancient Egyptians. What peaked my interest was the theory of a 3,000 year old technology to create “clay batteries”. In this particular episode, they suggested that Ancient Egyptians utilized citrus juices within these batteries to create power. This sparked my curiosity and my children and myself went back to the laboratory – this time armed with a variety of different foods. 2. Galvanize This – Although the original instructions call for galvanized nails, my children and I have found that zinc-coated screws work better as they provide more contact and have increased the voltage output of all foods we’ve tested. Insert the screw into your food product of choice on one side. 3. It is Copper – Again, the original instructions called for a penny. As it is a matter of copper, we’ve found that copper nails are much more efficient and don’t cost much in comparison. Insert the copper nail on the other side of the food item. 4. Your Own Goals – Now, here is where the experiment is dependent on your own developments. Are you going to make a series or parallel circuit? By connecting the food items in a series, you are increasing its voltage. By creating an elaborate parallel circuit, you are increasing the amps it will produce. Since minor electronics can operate on a miniscule amount of amps, creating a series to power a LED or clock is ideal. However, if you are trying to spin a computer fan that requires 12 volts and at least 600 mA, you’ll need to create a large parallel power supply to create the amps needed to spin the blade. 5. How to Set it Up – The copper nail within the food object is going to be your positive flow of electricity, normally signified by a red wire. The zinc-coated screw will represent the negative flow which is signified by a black wire. If you connect the positive wire from the first fruit to the negative on the second, you can produce twice the volts using the same amount of amps. If you tie the positives and negatives of both pieces of food together, you will get the same voltage. However, this will provide greater amps. 6. Metering it All – Using your voltmeter, your children can determine which combination of foods can produce more power than others. In our experiment, we saw a .3 volt increase in lemons as opposed to potatoes. Although oranges did exceptionally well against potatoes, providing a .15 volt increase, the lemons reigned supreme. Before our time ran out and the next experiment for the family was slated, we developed a system providing 22 volts of electricity and 160 milliamps while using 10 pieces of various food products. If we had more time, I am almost positive we could have reached what was needed to operate heavier electronics such as cordless phone bases and radios.